We’ve all seen the headlines. The eventual demise of cable television has been a recurring news story for some time now. Every day consumers across the country are ‘cutting the cord’ with cable providers, and instead, subscribing to online streaming services to watch TV and movies. The way the world consumes video content is changing. A new generation of streaming companies are redefining an industry that had, up until recently, been monopolized by big cable providers. Streaming companies like Hulu and Netflix have made huge gains in recent years — signing up millions of new customers while the big cable companies regularly report decreasing cable subscriptions and profits. Even with a trend towards online streaming, it’s still hard to tell exactly how much things have changed for the average consumer. In our quest to find out more about the cord cutting phenomena we asked you about your TV consuming habits. Over 2,500 Betabounders responded to our survey and here’s what you had to say. Almost 70% of survey respondents said they’re currently subscribed to a cable or satellite provider, as opposed to the 31% percent that currently don’t. To better understand our testers who have left cable behind, we asked how long ago that 31% cut the cord. Out of the 774 people in our survey who didn’t subscribe to cable, a staggering 66% cut the cord within the last five years. 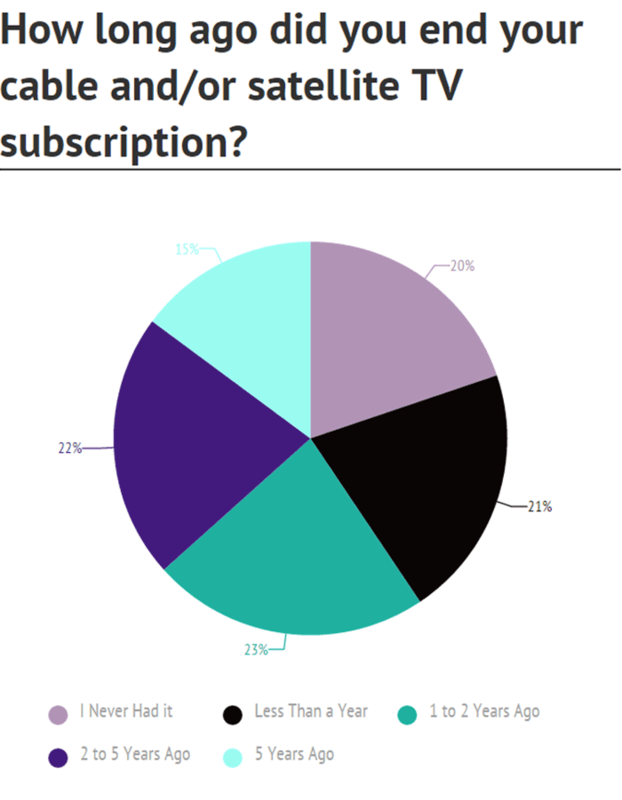 Only 20% have never had a cable or satellite subscription. The data suggests a steadily increasing march away from cable, with an almost 100% annual increase of cord cutters in the last two years (compared to the three years before). Who’s Cutting the Cord Next and Why? For the 69% who said they still have cable, we wanted to know how many of them could leave traditional TV behind. Over a quarter of our respondents said they plan on or are considering cancelling their cable or satellite services in the next 12 months. 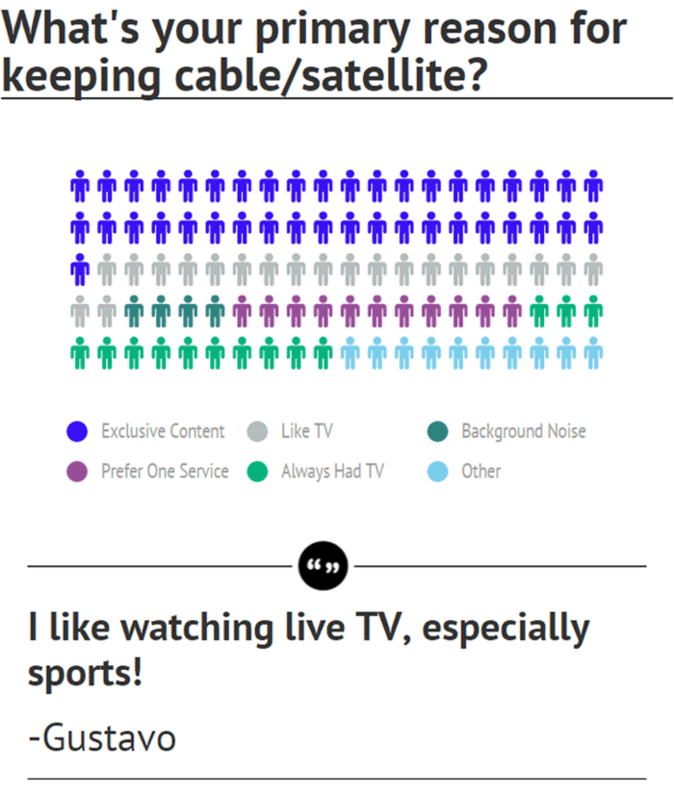 Often citing rising costs or underused subscriptions, 26% of Betabounders who currently have cable or satellite television say they’re thinking of getting rid of it some time in the near future. With 45% of respondents sharing that online streaming content was the primary reason for breaking with their cable provider, it’s clear streaming services pose a real threat to traditional cable providers. The often high costs associated with cable seems to be exacerbating the problem. With 34% of respondents admitting that saving money was important to them, streaming services can be a viable cost cutting alternative. Why Are Some People Keeping Cable? A popular longstanding criticism against cable television is that consumers end up paying for tons of content that they never plan on watching. Interestingly enough, the flip side can also be true about streaming services. Even though streaming subscribers get to cherry pick what they pay for and watch, that may not be enough for some consumers. 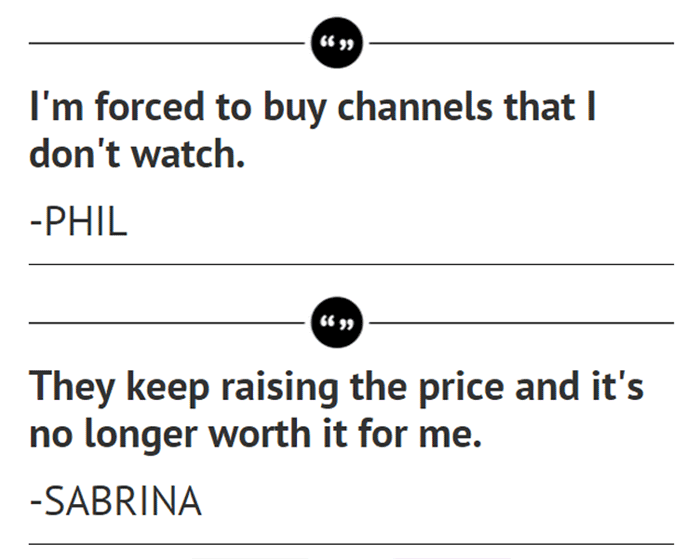 When we asked why people kept their cable subscriptions, we got some interesting insights. Many forms of content like news outlets and sports programming (ESPN for example) don’t offer stand alone streaming services. This sentiment is reflected by the 42% of Betabounders who said that lack of certain content from streaming services was the number one reason they still subscribed to cable or satellite. In second place, 21% of those surveyed said they just really liked watching live television. This isn’t surprising considering the long and robust relationship television has within American popular culture. Even with the advances in online streaming, many consumers still like the idea of flipping on their TV just to “see what’s on”. We suspect that as streaming services improve and more content like news and sports are readily available outside of traditional cable subscriptions, online streaming will continue to heavily influence the media industry. The question then becomes, how will the cable companies react? And what will the future of live television look like? Next week we’ll dive into cord cutting with more in depth insights about how our Betabound community consumes streaming and television content. Learn more about our TV survey!